Weekend Historical Happenings: 7/21/12 - 7/22/12 ~ The History Girl! The Chinkchewunska Chapter of the DAR presents their annual Christmas in July to make history come alive in Sussex County at our Elias VanBunschooten Museum! Three days, 11:00 am - 4:00pm. Their historic house, listed on both the State and National Registers, will be decorated for Christmas and open for complimentary tours. The house is a wonderful example of a Dutch Colonial style home circa 1787, filled with original pieces from the VanBunschooten and Cooper families, as well as many items of local historical interest including a Charleville musket carried in the American Revolutionary War. They will be celebrating the Chinkchewunska Chapter's 41st year of owning the Elias VanBunschooten Museum! 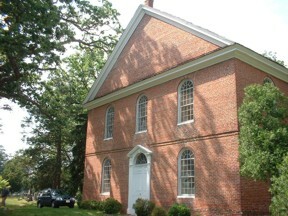 CAR (Children of the American Revolution) will be present to give tours of the historic Ice House / Milk Room and Privy! Lunch will be available for purchase from our Chapter's "Café Elias"; hotdogs, hamburgers/cheeseburgers, various side salads, chips, drinks, etc. Attic Treasures Sale will offer bargains galore! Demonstrators include the Lost Art Lacers of North Jersey, woodcarvers, a portrait artist, spinners, quilters and many more! The New Jersey Frontier Guard will be setting up camp Friday for a weekend stay! These wonderful re-enactors will be demonstrating life twenty years before the American Revolution. These brave men defended the western settlements of Sussex County by constantly patrolling the wilderness between fourteen forts. The 27th Regiment New Jersey Volunteers will be representing the Civil War on Saturday and Sunday. Come celebrate the 150th anniversary of the Civil War with these wonderful re-enactors. Located at 1097 Route 23, Wantage, New Jersey 07461. Contact Melanie for more information at 973-948-5299 or melaniej@ptd.net. 50% Off All items in our Gift Shop Annex! Be Sure to Check Out our "Everything's a $1" Table! Candles, Books, Decorations, Gifts and More! New Items Added Daily! Join skilled fiber spinner Claire Marinello as she discusses and demonstrates the Early American skill of using a spinning wheel to make wool into yarn at 2:00 pm. Attendees will witness the full processing of wool from the carding to the creation of yarn skeins. Space is limited. Pre-registration recommended, call 973-377-2982 x14. Admission (includes admission to the museum) is $7 for non-members & $4 for members. The Museum of Early Trades & Crafts is located at 9 Main Street in the heart of downtown Madison, just two blocks from the Madison train station. For information, please call 973-377-2982 x10 or www.metc.org. Three events on the same day, July 21, rain date July 22. The Atlantic Highlands Historical Society will have its Annual Arts and Craft Festival, from 10:00 am to 4:00 pm, with 60+ crafters exhibiting their wares. This is all hand-crafted by the artists themselves. Also three blocks of First Ave will be closed for a Street Fair with local vendors, including jewelers, restaurants, eyewear, and much more. From 6:00 to 10:00 pm, the Arts Council will present Film One Fest. There will be an art exhibition that runs till dark and then there will be the presentation of one-minute Films created by local artists. Lucy the Elephant's birthday celebration on Saturday, between 10:00 am and 8:00 pm, will feature the Zoo on Wheels, the traveling component from the Philadelphia Zoo. Lucy's friends from the animal kingdom will be on hand from 11 a.m. to 1 p.m. Also part of the fun will be a giant water slide, and 18-foot bungee run, a birthday cake, a bounce house, dunk tank and a junior sports games. There will be a photo booth where you will be able to have a commemorative photo taken with Lucy. Evelyn Johnson of Cape May Court House, author of Lucy's official bedtime storybooks, will be on hand from 10 a.m. to 4 p.m. to sign copies of her highly acclaimed children's books. Snacks will be available, a limited number of special collector's T-shirts will be on sale and visitors can enter a chance to win a giant Faberge egg featuring Lucy. To accommodate the anticipated larger-than-normal crowd Saturday, you will be able to park at the Union Avenue School, located on Union Avenue between Winchester and Monmouth Avenues. 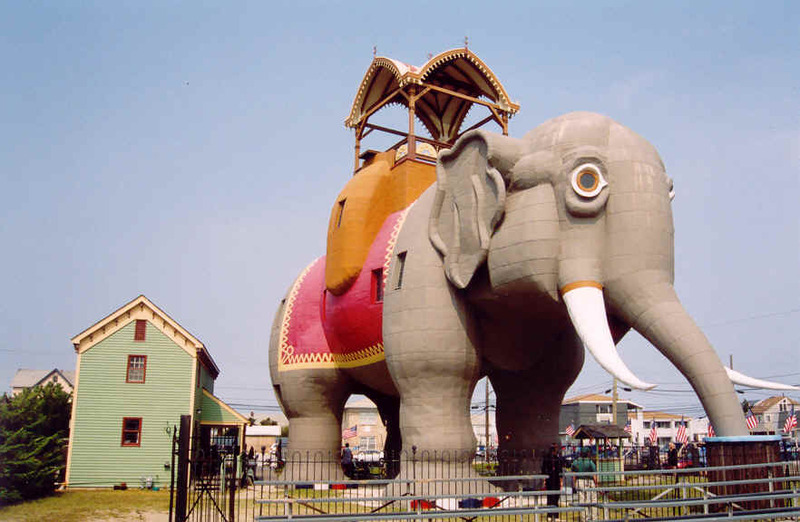 A complimentary shuttle, furnished by the Atlantic City Jitney Association, will be running every 15 minutes between the playground and Lucy from 10 a.m. to 8 p.m.
Lucy the Elephant is six stories high and is listed on the National Register of Historic Places. Lucy stands 65 feet high, 60 feet long, and 18 feet wide, weighs about 90 tons, and is made of nearly one million pieces of wood. Lucy was built in 1881 to sell real estate and attract visitors to Margate. Travel back in time with the Spring Lake Historical Society on Saturday morning, July 21, 2012. Members of the historical society will be guiding tours of the Third Avenue business district. Learn the history of the livery stables, dry goods stores, banks, tailors, coffee shops, restaurants, drug stores, and soda fountains. Those interested in the walking tour should meet at the flag pole in Divine Park, Spring Lake. Tours will leave about every half hour beginning at 9:00 am and will continue until 12:00 noon. The tour is open to the residents of Spring Lake and the public. This event is free. Experience all things unexplained at Historic Cold Spring Village's 'Paranormal Pursuits': Spiritualism in the 1800s,Saturday and Sunday,from 10am to 4:30pm. In addition to experiencing the Village's 26 restored, historic buildings dating from 1691-1912, guests can enjoy various workshops, demonstrations and tours which highlight the study of spiritualism and the paranormal. The Virginia Infantry Ghost Hunters will share the results of their research at Gettysburg and various other battlefields throughout the Mid-Atlantic. Based in New Jersey, the group uses video and sound equipment to identify the presence of spiritual activity, in the form of orbs and electronic voice phenomena, and will present their evidence to HCSV visitors. Visitors can also hear tales of the Jersey Devil, have their cards and palms read, try their hands at divining rods, and learn about phrenology and the rise of spiritualism in the 19th century. Guests can also explore the Village's own paranormal past and present during a ghost walk led by longtime Village staff member, Shirley Stefanovicz, at 11am and 2pm Saturday, and 2pm Sunday. At various buildings throughout the Village, Stefanovicz will detail the supernatural experiences had by Village staff members as well as the evidence of ghostly presences discovered by visiting mediums and psychics. Historic Cold Spring Village is a non-profit, open air living history museum that portrays the daily life of a rural South Jersey community of the Early American period. It is located on Route 9, three miles north of Victorian Cape May and a mile and a half west of the southern terminus of the Garden State Parkway. Admission during the season is $10 for adults and $8 for children ages 3 to 12. Children under 3 are admitted free. For more information on events, membership, volunteering, or booking private affairs, please call (609) 898-2300, ext. 10, or visit www.hcsv.org. Join food historian Susan McLellan Plaisted at this popular interactive event as she demonstrates harvesting ice to the moulding of ice cream. Only documented 18th century flavors, techniques, and original receipts (recipes) are used. The event also includes a guided tour of the 1719 William Trent House Museum. $5.00 adults, $4.00 seniors & children. Listed on the National Register of Historic Places and a National Historic Landmark, the Trent House is a Georgian-style manor house restored and carefully furnished as it would have been in the early 18th century. It is located at 15 Market Street in Trenton, adjacent to the Hughes Justice Complex. Ample free parking. The main floor of the Trent House and the Carriage House are wheelchair accessible. For more information and driving directions, visit www.williamtrenthouse.org or call 609-989-0087. The Old Broad Street Presbyterian Church in Bridgeton, will be open this Sunday, and the following Sunday, July 29, from 1:00 - 4:00 pm, so that visitors may see its exquisitely-preserved interior. This 1790s building has been called "perhaps the finest and least altered example of high-style Georgian ecclesiastical architecture in the original colonies." Members of the Friends of Old Broad Street Church and Friends of the Broad Street Cemetery will act as docents and gladly answer questions. Admission is FREE but donations are welcome. The church is located at 119 West Commerce Street, Bridgeton, NJ 08302. "Whitesbog's Villages of Florence and Rome," presented by Richard Prickett. Learn all about the men and women that provided the energy, expertise & labor to pioneer the cranberry industry for Joseph J. White, Inc. and helped Whitesbog become New Jersey's premier 19th century cranberry farm. This indoor photographic presentation will explore the villages of Rome and Florence that once housed the seasonal work force at Whitesbog. Attendees are welcome to explore Whitesbog Village on their own after the presentation. $5 members, $7 non-members, by reservation. 1:00 pm at historic Whitesbog Village, 120 Whitesbog Road, Browns Mills, NJ 08015, Pemberton Township, Burlington County, one mile west of Route 70 on County Route 530 at mile Maker 13. All proceeds benefit the Whitesbog Preservation Trust in their continuing efforts to restore and protect Historic Whitesbog Village and the surrounding Pinelands. For information and directions, visit www.whitesbog.org or call 609-893-4646.